David von Behren appeared on Show 273, recorded in June 2013, at age 19. 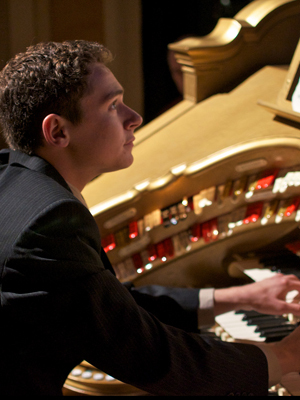 David von Behren (organ), 19, is from Falls City, Nebraska where he is a student at Falls City High School. A recipient of From the Top’s Jack Kent Cooke Young Artist Award, he studies music with Tom Trenney. David has been playing the organ for six years and has participated in Interlochen Arts Camp and New York Summer Music Festival. He plays trumpet in his high school band and in a Community Brass Ensemble and also sings his school’s chorus and has participated in Concordia National Honor Choir. Outside of music, David is involved in a variety of activities, including cross-country track, student council, lifeguarding, and math club. David is a Jack Kent Cooke Young Artist.